Isn’t it always the way. Get an extra week to rewrite a post and only hours after it was submitted do you think of the perfect paragraph to help make the point. Such is the case with my latest essay now up on PopMatters. For as much material as The Last of Us presents a critic, I find the only things I can sink my teeth into are esoteric details and concepts that have little to nothing to do with the main narrative. In this case it’s how the game treats the concept of the apocalypse and how it is so very different than what we see in nearly every other work of post-apocalyptic fiction. I call it an excersize in extinction (a turn of phrase I’m a little proud of). An early draft had comparisons to the manga 20th Century Boys and how the motivations behind the main villain of the series seem to mirror the developers presentation of The Last of Us’ world. In 20th Century Boys, Friend secretly manufactures a super virus and distributes it across the globe slowly gaining power has his organization magically comes up with a vaccine and paints the heroes as terrorists. He keeps evolving the vaccine until at the end the plan is to purge the remaining 60 million people from the planet. These survivors live in a post-apocalyptic squalor lorded over by an authoritarian police force and a deadly infection threatening to wipe them out. There are some interesting parallels, but I figured in the end it would be too outside most people’s experience and take to much set up to completely explain. Children of Men turned out to be a must closer comparison. As for that extra paragraph, it comes from expanding on the Romero zombie films idea that got added in during rewrites, because I realized they don’t quite fit the post-apocalyptic mold or at least aren’t obvious about it. Just consider the following to come after the part talking about Night of the Living Dead and Dawn of the Dead. Zombies are a faceless hoard, an irresistible force, but the question is always ‘what do they represent?’ In Night of the Living Dead they were the literal other whose presence pealed away civility to reveal the racial tensions of the time. In Dawn of the Dead they were representations of consumer culture and by making them actual mindless beasts revealed the emptiness of such a consumer capitalist existence. 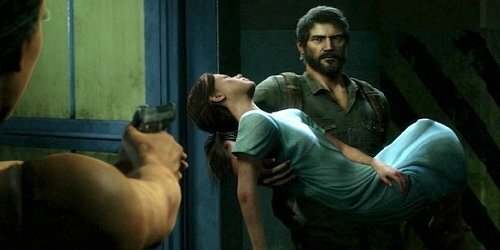 What do the “zombies” of The Last of Us represent? Their only purpose in both the plot and the narrative is to destroy humanity. They effect no other species, seem to solely target one species for food and remain solely a physical threat. There is no deeper meaning to their existence; they are simply a catalyst of our downfall. Naughty Dog’s Cordyceps zombie is their exercise in human extinction.